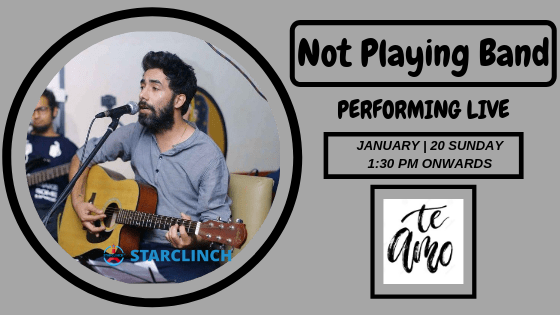 Not Playing Band is performing Live at 'Te Amo' on 19th Jan at 1:30 PM onwards. Not Playing is a live sufi band from, New Delhi. Not Playing is a vibrant and fun music band known for their exceptionally trained and skilled musicians who pull off a successful show every time. Not Playing band seen playing at big cafes, bars, restuarents, and parties around the city. Thanks to their immense popularity, the band – Not Playing also have been travelling across India for their music events. Not Playing is an amazing in playing Indian classical music with western contemporary. They absolutely love the audience and leaves them spellbound with their mesmerizing performance every time. They enjoy every song they perform, setting the stage on fire The audiences also love their Bollywood freestyle songs and offer a raving response to the delight of the band members! Their music shows get always loud cheers from their fans as they are skilled in keeping the audience entertained and make them groove to their tunes. Te Amo - makes its intentions clear as you walk in. Bright red sofas and shimmery golden pillows by the door. The restaurant tries to create some variance with the other end relatively bare save for abstract art and straight lines. Techno music from the DJ at another corner hints at bar-lounge ambitions. Te Amo’s menu takes inspiration from Latin American and Italian cuisine in no particular order. Our plate of 'Red Salad' promised beetroot, pomegranate and minced meat and delivered dry morsels of lamb, beets, corn kernels and limp lettuce in an unmemorable dressing. The 'Causa Croquette' was a munch-ey cylinder of mashed potatoes but skimped on the filling with only a finger-full of minced shrimp. 'Lomo Saltodo', plated as a Peruvian speciality, was overcooked dry sliced lamb and freezer-to-fryer French fries. Our 'Tiramisu' was thick mascarpone on a cracker base and a dusting of cocoa powder. Rather dry without any coffee liqueur and served with 2 'Ladyfinger Biscuits'. Te Amo also has an outdoor section which should be great during daytime in the colder months.